On Monday night I was lucky enough to attend a special evening at the British Library, celebrating the work of Mervyn Peake. The night began with a special private viewing of the library’s new The Worlds of Mervyn Peake Exhibition. The exhibition contained many of Peake’s original manuscripts and a lot of information about his life. I made lots of notes so will fill this post with the facts that interested me the most. The majority of the Gormenghast Trilogy was written in lined notebooks and I was surprised to see that his beautiful illustrations were sketched alongside his writing, with the lines from the notebooks running straight through the drawings. I’d expected them to be in a separate sketch pad, but Peake clearly liked to have a strong image of each scene in his head before writing it. Almost all the drawings were done using the same pen that he used for writing. …..from now on, I, like Titus will be alone in his wanderings. Meryvn Peake was born in China and he lived there for the first twelve years of his life. The country had a big impact on his writing and its influence can be seen in several sections of the Gormenghast books. 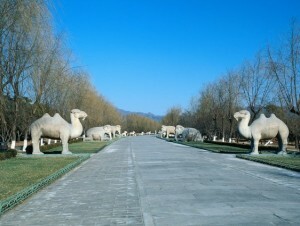 The Hall of Bright Carvings was inspired by The Spirit Way at the Eastern Imperial Tombs, near Beijing. I was also surprised to see Peake’s drawing of Gormenghast Castle. I had imagined it to be based on European castles, particularly those found in Eastern Europe, but his drawing showed it to look more like Chinese Palaces balancing on rocky outcrops. I wish I could have taken a photo of this illustration as I think you’d have been as surprised as I was. 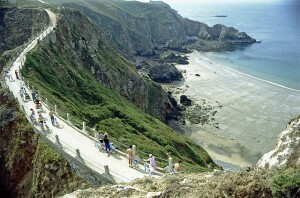 Sark, one of the Channel Islands, was also a favourite place for Peake. Many of the place names in Gormenghast can be traced to Sark and the stacks of rocks found on the island echo those around Gormenghast. 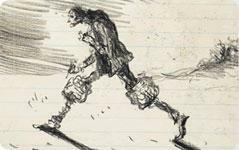 The Worlds of Mervyn Peake Exhibition is at the British Library until 18th September and is entry is free. After viewing the exhibit we were treated to a wonderful discussion of the books with Sebastian Peake (son of Mervyn), China Mièville and Brian Sibley. 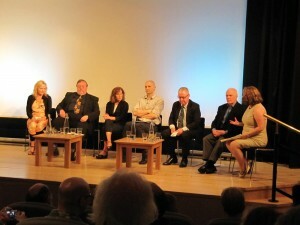 Zoe Wanamaker, John Sessions and Miranda Richardson also read some extracts from the books. The power of the words combined with their acting ability makes me wonder if I should be listening to the audio version, instead of reading the print version. We also heard a snippet of the new Radio 4 have serialisation of the Titus books and I was very impressed. The first episode is available to listen to on iPlayer now. Titus Awakes, the fourth book in the series, was introduced to us. It was written by Maeve Gilmore (Mervyn Peake’s wife) and has a different feel to the other books. I didn’t realise that Mervyn Peake had plans for lots of different Titus books and I’m sorry that he died before he had the chance to write them. I look forward to seeing how Titus’s journey continues and wonder whether any more books will be written to continue his adventures. As a child Peake almost lost fingers to a camel, hence the “vile camel” in Titus Alone. The Dark Breakfast to celebrate Titus’s 1st birthday was written in 1942 as “occupational therapy” after Peake’s mental breakdown. Peake held his pen vertically as he wrote and illustrated as this is the way he was shown to do it by a calligrapher in China. Peake loved people spotting – sketching anyone who had interesting features. Graham Greene was the literary talent scout who spotted Gormenghast, but he was also the person who recommended removing all Peake’s illustrations from the original publication. It was a wonderful evening and I’d like to thank Vintage for inviting me along and making me even more excited about reading The Gormenghast Trilogy. This looked really interesting, I’m glad you got the chance to go. I’d listen to the radio 4 show if I had time but I’m still struggling to concentrate on book 2. Ellie, Sorry to hear that you are struggling with book 2 – I found it hard to adjust to the differenec in writing style at first, but I am now loving it as much as Titus Groans. I hope it grabs your attention again soon. I was hoping you’d make it to this exhibit and do a post on it. While I’m not a fan of the books, I do think it would be fun to see the illustrated manuscripts with the lines through the drawings. Do the match the final illustrations or are they more like first drafts of them? And I have the same handwriting issues Mr. Peake did, alas. Very good question! I think most of the illustrations were for his own benefit and so I’m not sure I’d describe them as drafts. All the illustrations of the same character were very similar – with facial features being very vivid, even when viewed from different angles. I didn’t see many final illustrations, but it could be that the one skecth pad with them in was only open at one page and so I missed out on seeing them. Knowing how you feel about the author, I’m thrilled that you were able to attend such an event! You had to have been floating on cloud nine. I’m really enjoying the radio 4 show, but I’m woefully behind on this week’s reading. I’m so glad you got to make it to the exhibit! Sounds like a great time. Birdie, I haven’t listened to the Radio 4 show yet and can’t decide whether I want to at the moment. I really want to listen to it and get hold of the BBC DVD, but I don’t want to overload myself with Gormenghast. I am thinking perhaps it would be best to wait a few years before doing either – that way I’ll get to relive the magic a bit at a later date instead of devouring it all at once. Ooh I’ve been eyeing on the exhibition and thinking to go there. I love that there are illustrations by Peake himself and they look so interesting. I’ll make sure I go. Who knows I might want to read the book after seeing the exibition. I wonder if the illustrations are included the books these days (or if they will be)? which contains a lot of the illustrations. Let me know what you think of the exhibition if you manage to make it. There are so much interesting events going on right now for Peake’s centenary! I’m so behind with my reading of Gormenghast and have a busy time coming up so I’m going to get even more behind! Margaret, I’m so pleased that I decided to read these books now – I love the fact that I keep hearing them mentioned in various places. There has never been a better time to read Gormenghast! I hope you manage to catch up with us. What a terrific opportunity for you and a great coincidence since you’re reading his trilogy! The exhibit and presentation sound very good. I love that Peake’s wife couldn’t read his writing/scribble. The Eastern influence in the Gormenghast castle and other thngs is interesting, too. It would throw me off course a bit if I had one idea of the castle & it was vastly different than Peake’s. I hope it doesn’t bother you. Thanks for sharing this event! It isn’t really a coincidence that I’m reading it now – I was actually persuaded to read it when I heard Sebastian Peake talk about the books at another event to mark the centenary! I’ve been to Spirit Way in Beijing! We went on holiday to China in 2004 and Spirit Way is truly amazing – it goes on for what feels like miles. You can actually sit and stand on the statues too (imagine being allowed to do that in the UK???). Now I’m even more curious to read this trilogy! The Book Whisperer, For some reason I didn’t make it to the Spirit Way when I went to Beijing. I don’t think I knew it existed, which is a shame as it looks fantastic. I hope you decide to read these books soon as it would be good to have a discussion while they are still fresh in my head.